Laundry happens. And then happens again. And again and again, for the rest of forever. I’ve shared so many laundry tips through the years and I’ve even shared my own laundry schedule, but today I want to put it all together for you. I’m going to start at the beginning and guide you step by step through how to make laundry easy. First, let’s establish that there are different kinds of laundry and group like laundry into categories: adult clothes, kid clothes, towels, bedding, and kitchen laundry. Grouping makes so much sense for so many reasons. You probably wash each type of laundry in a different way. For instance, I only hang dry my clothes, but I dry my kitchen towels on extra high heat and I mix colors for my kids clothes, etc. Another reason to group laundry is to break a big job into small manageable chunks. When I hear the phrases “mountain of laundry” or “loads of laundry” it makes me want to cry for people. A mountain of anything would feel daunting, but especially dirty clothes. A load of towels that I can fold in 10 minutes while I talk to my kids or watch tv … that sounds much better! Excepting the weeks of my broken foot, my laundry is never behind or stressful to me. My guess is that people with “mountains of laundry” actually think about their laundry way more than I do. My laundry doing is on autopilot. I wake up on Monday already knowing how I’m going to do the day’s laundry, there is nothing new to figure out. I’ll start the table cloth from Sunday dinner in the wash on a speed cycle, and then throw the kitchen rag laundry in the washer after I wipe the counters from breakfast. If I’m worried I’ll be too distracted with a project, I’ll set a timer on my phone to remind me to move something to the dryer. I also know that while I prep dinner Monday night, I will bring those towels to the kitchen table and fold while dinner bakes or ask my kids to fold them while I’m cooking. That tablecloth is a quick fold and put away as it comes out of the dryer. You may have begun this attempt at laundry already assuming you’ll fail, so when you have your first off day or look for any excuse to avoid laundry, you give up on the schedule. Beware, or the laundry monster will take up residence on your laundry mountain again. Quit thinking all or nothing. Give yourself a few weeks to work out the kinks of your schedule. Expect yourself to do it imperfectly, especially at first, but have faith that following the schedule imperfectly is still way better than the alternative. With time, you’ll be amazed at how you’ll start to rely on your schedule and the freedom it gives you to actually say you’re DONE with laundry after you finish the day’s category. I’ve found ways of handling the different types of laundry that makes the laundry system run smoothly. One important thing that is instrumental is that I end each day with all clean laundry put away. There are no stragglers in the dryer or a laundry basket or creating a monster mountain somewhere. I give myself the gift of a clean slate with laundry every day. My trick for my kids beds is an extra set of sheets in the linen closet. This way I’m only having to go to each bed once: take the dirty sheets off and put the clean sheets on all at one time. Then I take the big pile of sheets to the washer, put it in the dryer when I remember a few hours later, and then fold them and put them in the linen closet before I go to bed. For washing my bed’s sheets, I strip the sheets and wash them and then put the clean pile on the bed. The sheets have to go back on the bed before I can sleep. Usually my husband and I put them on together when he comes home. I do have spare sheets for my bed, though I don’t get them out weekly. I still have them because I learned that was necessary when my big kids were little. Having a sick child puke on your bed without replacement sheets is a lesson I only needed to learn once. I keep a hamper in each bathroom that has a bath in it, so towels can be put there easily. I wash the towel laundry for the downstairs bathrooms and upstairs bathrooms separately, because it makes each load manageable and very easy to put away. If I combined them all I’d have to fold and sort and then take a million different places. If you don’t have stairs, you may consider separating loads by bathrooms. It really does simplify things! I’m kind of picky with the adult laundry. I want our clothes to last a long time looking good, and not just last a long time because we keep wearing clothes that are worn out (which I totally think my husband would be willing to do – he is a frugal man at heart). We separate our clothes into 6 different wash types as we undress in our closet. I use these fun laundry hanging bags (I show how to sew them in the post linked to the picture). You know I’m a Shaklee distributor and this laundry detergent helped me make that decision three years ago. I had been using the cleaners for a while as just a customer, but hadn’t tried anything else. Then I noticed my daughter’s skin felt very dry and rough and I remembered reading something somewhere about Shaklee laundry detergent. I thought why not give that a try? I did try it and I fell in love. My daughter’s skin improved quickly and as a bonus, our clothes were cleaner. They are made with safe ingredients that I trust even with newborn laundry. Let me introduce you to my laundry dream team!! Fresh Laundry – Gets my clothes super clean every time. Also works as a stain fighter. I’ll put the straight concentrate on stains before putting them in the wash. Nature Bright – Whitens and brightens. Add a little to loads like kids clothes and towels. Magic. Basic H2, degreaser dilution – Basic H2 is a cleaning concentrate. I use the degreaser dilution (1.5 tsp Basic H2 in 16 oz. water) mixed with Nature Bright to get out tough stains. Soft Fabric – I don’t use this every load, because I’ve just never been that into fabric softener, but I love it for my towels and some of the loads of clothes. 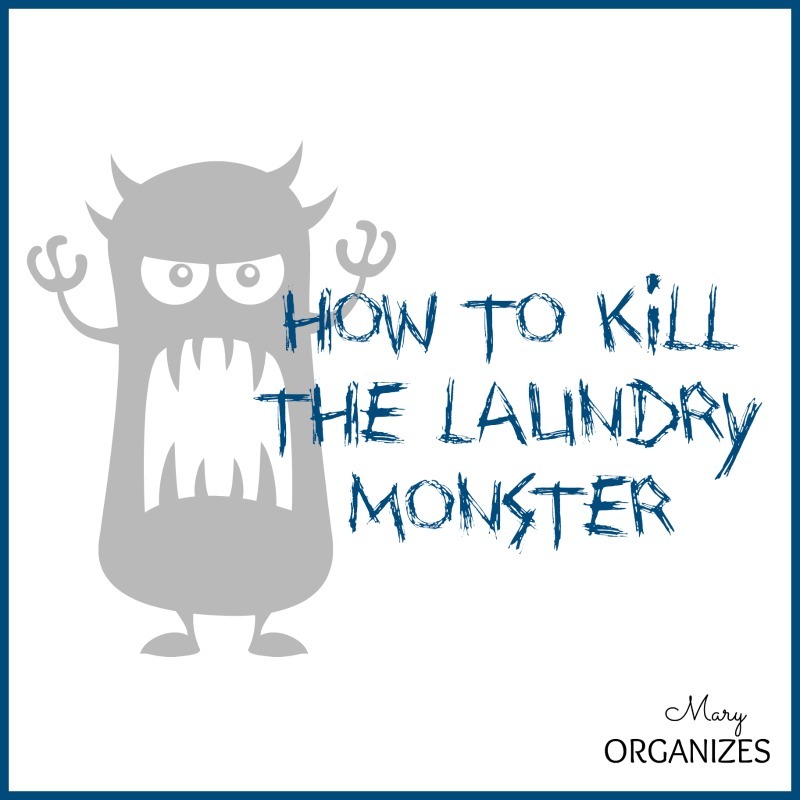 Kill the Laundry Monster once and for all!!!!! Man, I always enjoy a good discussion of laundry. I may have a sickness. Yes, it is like a magnet pulls them towards our beds before anything like that happens! I always say I’d rather my bed than theirs, because at least they have a place to go to sleep as soon as you get them comforted! Use them! I love all the different settings!! Love your organizing ideas about the laundry. I love these ideas, but I wish some of them were written with tips in mind for working adults with kids. It’s a great idea to cover one type of laundry each day, but it’s not realistic for us. Example: On Tuesdays and Thursdays, we’re all gone from 7:30am to 7:30pm, and when we get home there are dinner, homework, and showers for 4 people to get through before bed. Sports practice changes every week….. So do work schedules, sometimes. Most of the families I know face these issues, and many of these tips don’t allow for variation in schedule. Great ideas, just too rigid for our household. L would love a system for those of us who are NOT blessed with a washer and dryer in OUR house. There has to be an easier way than 4 hours at the laundromat each week! I’m seriously considering reducing our clothes to 2 weeks worth PERIOD! One week to wear and one on the drawers in case it’s a very dirty week. Mary – I am writing to thank you. After YEARS of not being able to keep up with the laundry (and we only have a family of 4, plus 2 pets), I finally came across your system. Before I found your system, I was constantly frustrated by the laundry and always had unfolded laundry sitting around. I have been using your method for at least four months now, and I rarely get behind. It works! Thank you, thank you. The key for me is the sorting into types of laundry and then only doing certain types each day. I have a schedule and I stick to it. You have made my life much easier and less stressful. Thanks for sharing your technique. You are so welcome! I am so glad you’ve killed that monster … it makes life SO MUCH EASIER!